So why hasn't Obama been more "helpful?" Cole says "the most immediate" (?) reason is that Obama's clemency initiative "has not been provided with sufficient resources." Cole then adds that "critics" claim "the review procedure may be unnecessarily biased toward rejection." Finally, he notes there are "reasons" to "question" the criteria employed by the clemency initiative. Notably missing from the explanation: Barack Obama, the President of the United States. The one person who can exercise the pardon power unilaterally, any time (before, during or after conviction), for any federal offense, for any reason(s) or no reason at all. Cole does not mention that Obama retained George Bush's Pardon Attorney and appointed Eric Holder attorney general. Holder brought more clemency controversy mud on his suit to the position than any cabinet member in history (and that we have researched). 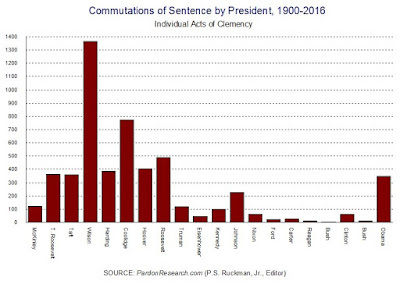 Nor does Cole mention that President Obama waited longer than almost every other president in the history of the United States before granting the first pardon of his administration. Cole does not mention that President Obama's first term was the least merciful complete term since that of John Adams. While he is want to give undue "credit" re commutations of sentence, Cole says nothing of Obama's outright abysmal record on pardons. And now, at the end of the term, what of the concern that last-minute pardon splurges rarely have a positive impact on the reputation of the pardon power and public trust? Not even on Cole's radar. See Cole's New Yorker piece here). It is very sad to hear and know that President Obama talks about giving qualified citizens who have applied for a "Pardon" and yet he is just sitting on them with no actions to move their lives along. It seems that commutations for drug offender are his favorite signatures. Sad! Guess his failures will out weigh his accomplishments for his legacy. We are not buying into the narrative that Pres. Obama is slacking in granting pardons due to resources. He has spent more than all other Presidents combined from my sources in 7-3/4 yrs. The problem is that he is not allocating the proper resources to departments and divisions within his administration. His priorities for granting Pardons is at the lower end it seems. At least this is what is perceived. If anyone else has information that would contradict this please feel free to express their opinions also!